This Simpson point was found several years ago in the Suwannee River in either Hamilton or Suwannee County, Florida by Joe Page. It's made out of a dark green translucent agitized coral that is heavily patinated. One side of the base has a nice thinning flake removal measuring 5/8 inch (1.6cm) long. This is a very good example of Simpson point. It measures 3 inches (7.6cm) long. Simpson points are found on early sites in the southeastern United Sates in the general region of Florida, Alabama, Georgia and Mississippi. 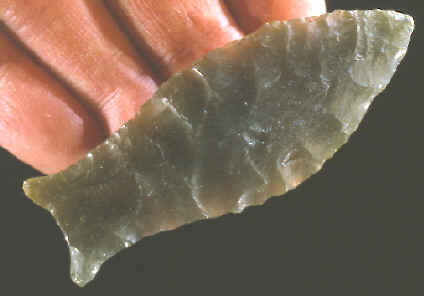 Simpson points are often found on sites that also produce Clovis and Suwannee points. The two earliest point types found on the scientifically excavated Harney Flats site, in Hillsborough Co., Florida, were Simpson and Suwannee points. An estimated date for Simpson points is 9,000 to 10,500 years ago. Some archaeologists believe they may be older. Similar points are found south of the U.S. border all the way to Argentina where they are called "Fishtails" because of their outward curving basal "ears". A cultural connection between these two similar point types may one day be proven. Both Simpson and Fishtail points have concave bases and highly recurved blade edges. The bases of these points are usually either slightly or heavily thinned or in rare cases even fluted but there was no main tradition of fluting Simpson points. Simpson points were named in 1968 by Ripley P. Bullen after examples found in the J. Clarence Simpson collection in the Florida State Museum.